Create the ideal planting bed by taking your gardening to new heights. • They ensure the excellent drainage so many of our favorite plants demand. This prevents winter losses--they're not sitting with their roots in ice for months at a time. • The soil in raised beds warms up more quickly in spring for earlier planting, blooming, and harvesting. 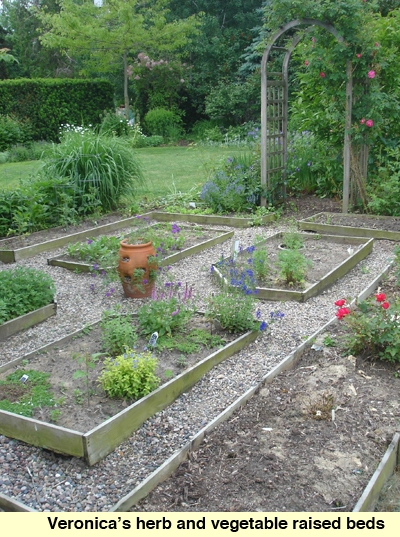 • Raised beds allow you to create perfect soil. • They minimize weeding by creating the world's best edging. Make them out of anything you like--concrete blocks, recycled bricks, landscape timbers, etc. Raised beds need be only 4 to 6 inches high, though those that are 1 foot or more high are excellent. Make sure they are well-anchored, either with stakes or by burying at least 2 inches of the edging material into the ground. If the bed is only a few inches high, work the into the existing soil plenty of compost, sand, or sphagnum peat moss to loosen and enrich the soil and promote even better drainage. This digging is enough to kill any grass or weeds. No chemicals needed. Fill a raised bed with the best soil possible. I like a blend of about half topsoil and half compost purchased from a landscape company or garden center. However, just plain topsoil will do. Be careful of the stuff sold in bags. Ask to open a bag at the garden center and check it out. It should be dark, moist, very crumbly, and not have very much sand, if any. And it should smell like good garden soil—no foul, pond-like odors. If you need to buy more than a dozen or so bags, consider purchasing soil and/or compost in bulk from a landscaper or garden center. However, be sure to be home when it is delivered and be prepared to turn down the delivery if the soil isn't fairly dark and crumbly. Much soil sold as topsoil is actually very poor quality. In most cases, you don't need to lay anything down at the bottom of the bed. It will only get in the way of the plant roots. Landscape fabric or other materials at the bottom are not needed to supress weeds since the soil on top of them will naturally suffocate them anyway. In some cases, a barrier may discourage burrowing animals, but even then, they can always go through the top if they're determined.